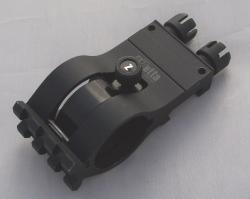 The new Elzetta ZROC Tactical Flashlight Holder features all metal construction with a main body of Mil-Spec Type III Hard Anodized 6061-T6 Aluminum. The ZROC attaches to Mil-Std 1913 Picatinny Rails in an ergonomic low profile offset position using dual coin-tightened Thumb Nuts for extra holding power. The Thumb Nuts may be secured using either a safety wire or the included cotter pins. ZROC also features a Quick-Release Thumb Screw for rapid installation and removal of flashlights and an integrated Picatinny Rail for attaching a laser, navigation light, or other accessory. All Elzetta products are Made in the USA.